Cloth Diapering | What About the Poop? “What about the poop?” was the first question out of my husband’s mouth when I told him that I wanted to cloth diaper. I have been an avid follower of Styleberry Blog and I quickly referenced her when I answered his question: Bummis Bio-Soft Liners. These are a life saver and I’m sure they come straight from the cloth diapering gods above. This product really does help the cloth diapering experience as a whole and I think they are one product that my husband could not life without. This product is what sold my husband on using cloth diapers. 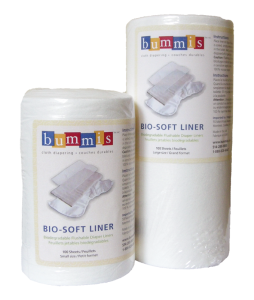 The liners come in two sizes (small and large), in a roll of 100 sheets. To best describe them to someone who doesn’t cloth diaper, they look like dryer sheets. 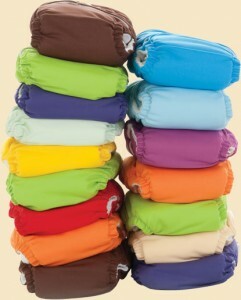 To use them, you lay one sheet on the diaper so that it is between your baby’s bottom and the diapering system. When your baby poops, it almost catches the poop and prevents it from spreading on the diapering system, making it WAY easier to clean during the next change and when washing the diaper. When you change the diaper, all you have to do is plop the liner and the poop into the toilet and flush; no diaper sprayer, diaper dunking or grossness! If your baby doesn’t poop and only pees, the pee just goes right through to the diaper! Pick up this product; it will change your cloth diapering life!